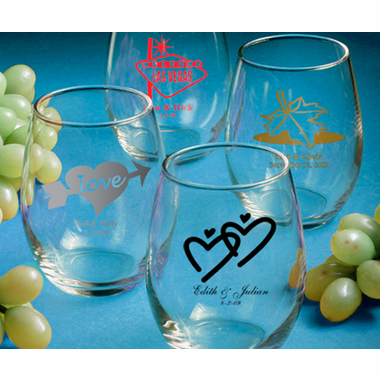 It's clear that these stemless personalized wine glass favors are a great way to inspire a truly memorable toast on your special day - perfect for wine wedding favors, birthday favors, anniversary favors, retirement favors and every other occasion where cheers are anticipated! Each measures 3.75 inches tall and 2.5 inches in diameter, with a 9 ounce capacity, in the hot new stemless wine glass design, great for not tipping over or breaking the stem! These glasses also work well for use as a unique dessert glass or mini vase use at place settings! 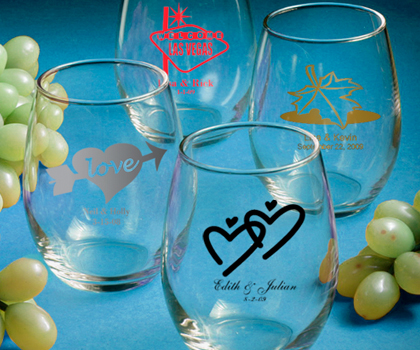 Made in the USA, each is made of clear glass and they're are ready to be silk screened with amazing accuracy directly on the glass in a wide variety of all occasion themes, designs, colors and titles that match your theme and your personal preferences. Sure to be a hit, these wine glass favors come bulk packed.